The data in Hua et al. support a model for the recycling of synaptic vesicles proposed by the Edwards lab several years ago. The model predicts that different synaptic vesicle pools derive from different endocytic pathways. Recycling pool vesicles appear to originate from clathrin- and adaptor protein 2 (AP2)-dependent endocytosis, and resting pool vesicles from a pathway involving the adaptor protein AP-3. Click for full size. According to the scientists at the University of California, San Francisco (UCSF) who conducted the research, the discovery doesn’t change the players involved so much as it reveals that the rules of the game are very different than previously assumed. Better understanding these rules may help researchers find new ways of addressing neurological diseases like Parkinson’s, which may arise in part because these normal brain processes go awry. The players in question are known as vesicles – tiny sacs filled with neurotransmitters, the chemicals that neurons release to transmit a signal to the next neuron in the circuit. Scientists have known about these vesicles and the important role they play in brain function for decades, but mystery remained because there appear to be two distinct pools of vesicles, with no understanding of what accounts for the distinction. All the tiny vesicles in an average neuron look the same, even to a trained eye peering through a powerful microscope – the same way a bunch of players wearing the same color on a given field of play would seem to belong to the same team. In the journal Neuron this month UCSF professor Robert Edwards and his colleagues present the first evidence that, despite their appearance, vesicles in the two pools have distinct identities and fates, which are defined by the particular proteins on their surfaces. “They look identical, but they contain different proteins,” Edwards said. 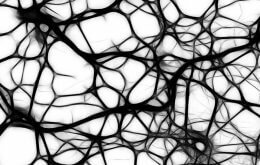 Neurons, which make up the white matter in the brain and the nerves that run throughout the body, are basically just specialized cells with very long extensions – sometimes a meter or more in length. Down these spaghetti-like nerve fibers travel electrical impulses, which will cause the neuron to release some of these tiny vesicle sacs, spilling their chemical contents into the synapse, a gap between the nerve ending and the next neuron. The chemicals then seep over to the adjoining neuron, sometimes triggering it to fire in turn. This basic game of neurotransmission is played trillions of times over by the 10 billion or so neurons in the human brain. Some neurons are so active that they fire as many as 100 times a second, requiring mechanisms to sustain these high rates. The vesicles play a crucial role in this process because they allow neurons to fire when ready. Neurons use the vesicles to package the chemicals and transport them in advance so that they can release as soon as an electrical impulse arrives. Since the release sites are far away from the cell center, the vesicles must recycle locally to maintain high rates of release. For years, scientists have observed that while all vesicles appear identical, they actually exist in two different pools. The smaller pool, found at the extreme land’s end of the neuron, holds the ones that release neurotransmitters when an electrical impulse arrives. After release, the vesicles are quickly recycled for continued use, and for this reason scientists have called this the “recycling” pool of vesicles. The second pool of vesicles can be much larger, accounting for up to 80 percent of all the vesicles at a synapse. Surprisingly, these vesicles do not respond to electrical impulses. Instead they sit dormant when the signal arrives and, because of this, scientists have dubbed this the “resting” pool. “It’s not clear what they respond to or what their function is,” Edwards said. Because the vesicles in the two pools appear to be identical under the microscope, nobody knew if there was actually any difference between them. In the past, many scientists hypothesized that the difference was simply a matter of location – the recycling ones come into play when an electrical impulse arrives simply because they happen to be at the right spot for release. But some scientists pondered whether the identity of the vesicles determines their behavior and not the other way around – that the recycling ones are in the right spot because they are the ones destined to be released. It’s sort of like asking whether a soccer player is a goalie because he happens to block shots near the goal, or because he’s designated to be the goalie. The new work essentially shows that goalies block shots because they’re goalies. In their paper, Edwards and his colleagues show that vesicles in the two different pools contain different proteins and that these differences determine how they behave. Using a technique for labeling proteins with glowing molecules derived from jellyfish, they were able to show that a protein called VAMP7 is present at high levels in the resting pool rather than the recycling pool, which contains more of other synaptic vesicle proteins. This shows that the body makes and maintains different pools of vesicles containing different proteins for different purposes: release or some other function. According to Edwards, the observation has far-reaching implications for our understanding of how neurotransmitters are packaged, transported and released from neurons. “What’s happening is not a simple, monolithic process,” he said. The observation gives new insight into the function of the brain at the most basic, microscopic level. It also may help unravel some of the secrets of neurological diseases, aspects of which may be related to how vesicles are produced and released. According to Edwards, resting vesicles are involved in a separate not-well-understood process in which neurons spontaneously release vesicles, which may help them adjust the types of connections they make with each other as well as the strength of those connections. This process may play a role in neurological diseases, many of which are characterized by changes in the type and strength of synapses. The article, by Zhaolin Hua, Sergio Leal-Ortiz, Sarah M. Foss, Clarissa L. Waites, Craig C. Garner, Susan M. Voglmaier, Robert H. Edwards appears in the August 11, 2011 issue of the journal Neuron. This work was supported by a fellowship from the American Heart Association and a grant from the National Institute of Mental Health, one of the National Institutes of Health.